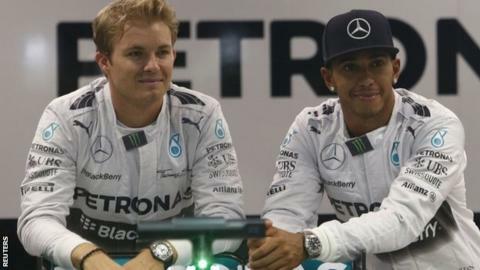 Nico Rosberg says he expects more tense moments with Lewis Hamilton as their title battle reaches its climax. Rosberg was disciplined by Mercedes after the two collided in the Belgian Grand Prix, and they have been told such incidents must not be repeated. Speaking in the build-up to Sunday's Singapore Grand Prix, Rosberg said: "There's going to be ups and downs, more difficult periods. "It will continue to be intense and hopefully a great battle." Rosberg is 22 points ahead of Hamilton with a maximum of 175 available in the remaining six races. Hamilton reduced the gap by seven points with a dominant victory in Monza two weeks ago, fighting back from a bad start to pressure Rosberg into two mistakes, one of which gifted the Briton the lead. Rosberg denied the manner of Hamilton's win in Monza - his sixth of the year compared to four for the German - had been a blow to him. But he admitted that he had analysed the event to try to improve for the next race. "I don't see it as such a disaster," he said. "I review [the races I lose], because I know for myself it's the things that don't go 100% perfectly is where I learn the most. "For me it's still a very pleasurable moment. I am aware of how fortunate I am to have a car like this." Rosberg's lead has largely been founded on his greater reliability. He has failed to finish only one race whereas Hamilton has retired from three, including after the collision in Spa, and has had two reliability failures that forced him to start from the back of the grid in Germany and Hungary. "Nothing changes," Hamilton said. "It is the same from race one to the end of the year. Of course, if you lose out in the first race, you still have a long way to go. But when you get to the end of the season, it's 'Jeez, I'm running out of time'." Red Bull's Daniel Ricciardo believes he is still in the running for the title as well. The Australian is in third place, 72 points Rosberg but has taken three wins in the last seven races. "The mentality hasn't changed since the start of the year," Ricciardo said. "The approach is to attack and get as much as we can. That's what were going to need to do to get close to Mercedes." Red Bull struggled in Italy, with Ricciardo managing only fifth, but he expects to be much more competitive on the tight Singapore street track. "I'm expecting a podium," Ricciardo said. "We have to aim for that really, especially if we want to stay in the title hunt. "The question is how close we can get to Mercedes. I definitely think we're going to be closer than Monza. This is a track that should help us out a bit more." Rivalry set to heat up in Singapore?